The Severe Weather Shelter will open for the first time on Tuesday, December 19 at approximately 7:00 pm. There will be a volunteer orientation and set-up at 5:30. Anyone interested in learning more about the Shelter and its operation is invited to attend. We currently have volunteers to staff two days, and we are hopeful more will step up to keep it open during the approximately five cold days to follow. A fluid, changing forecast makes it difficult (but not impossible!) to anticipate. 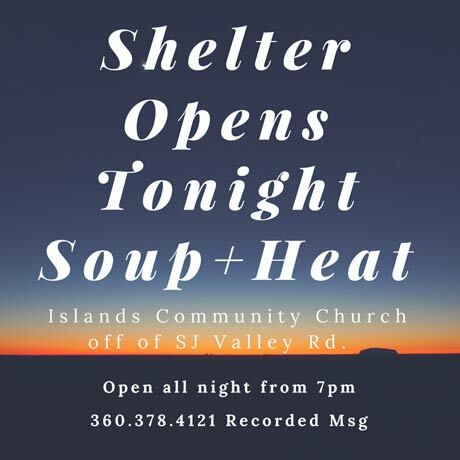 The location for this first rotation is Islands Community Church, 127 Gilbert Lane just out of town off of San Juan Valley Road. Please call the United Way of San Juan County phone number, (360) 378-4121, for a current recorded message about Shelter openings. Volunteers can sign up on our SignUp Genius page. Each shift must have minimum of 2 volunteers. By clicking the link to the Sign Up Genius page at any time at SignUpGenius http://www.signupgenius.com/go/10c094caca823a5f94-severe1, anyone can see whether or not we are able to open. According to sign ups at the time of this release, we are hopeful that a few more volunteers will step up to fill several of the overnight slots for the anticipated cold snap this week. One of the overnight slots offers a $100 stipend. Background checks are required of any volunteers. If you would like to volunteer but have not yet seen the training video, that’s fine! Sign up for a training slot. We will get the materials to you.